I may have the £££ to buy a new kit in the near future. Having built various kits over the years I've decided on a DN-01 or XV-01 as possibilities. Having read a few build threads it seems they are more of a challenging kit to build and "nice" out of the box compared to my current TT-02B & DT-02. I know they are totally different formats but I'm wondering if anyone has both, or either and has any thoughts (good or bad) on them. When I do use my cars it's usually on rough dirt/gravel so I'm leaning towards the DN-01. I have a DN01 and a DT03. The DN01 is just so lovely to drive. Both in itself and compared to the DT03. My DT03 has a tonne of hop ups and the DN01 was still nicer to drive bone stock. Lots of tweaking options too as TRF201 parts are still available and things like Associated Spur gears are a direct fit opening up gearing options. Can't help with the XV01 but I can't fault you going for the DN01 over a DT series buggy. I've never driven a XV01, but they seem pretty skiddish on videos probably by design. My vote would be tor the DN01. If you were not used to building RC cars, then I would've said to start with DT02. But since you built many cars before why not go with DN01? Both are more off-road capable than XV01. Sometimes Tamiya gives you a bit of a problem. The shock piston head could be thicker than the e-ring notches on the rod. You'd have to improvise.... to thin it by sanding or carving. 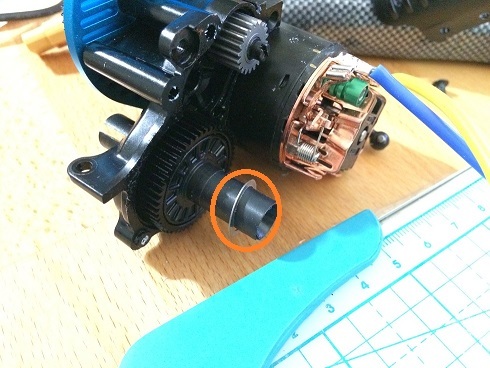 DN01 differential has a big gap so it kinda moves left and right in the gear box. I had to order a couple of big shims to remove that gap (10mm inner diameter washers?). The Instruction asks for 1 & 1/2 sponges in the drive cup, but sometimes they are binding, so you'd have to reduce the thickness. (I might have used 1?) Strange as it sounds, I use of faucet grease as ball diff grease. Tamiya's ball diff grease was made for on-road cars decades ago. Faucet grease is thicker and stickier; it gives you more adjustability without having to over tighten the bolt. If you are building DN01, there are more of these things to watch out for. If you are building DT02, far less to go wrong. I'm sure there are guys who can do all these perfectly in their second car or 3rd car. Yeah, well, I couldn't do it. I think I ended up doing all these things correctly only after building 5-8 cars. If the pinion gear not lining up and spur gear worn unevenly, or got the shock lengths were different and tires wore out unevenly, if you lost balls on the ball diff... if these memories are fresh, you'd be better off with DT02. If you do get a DN01, make sure to double check everything at every step. Don't trust the instruction 100%. I have a feeling that when it comes to upper end cars, Tamiya assumes the builder has 10 cars under his belt, which is not always true. If your entire driving time during 2018 happens to be just 90 minutes total (30 min x 3), would you be able to appreciate DN01 over DT02? I would not. Is it a better car? Oh yes. 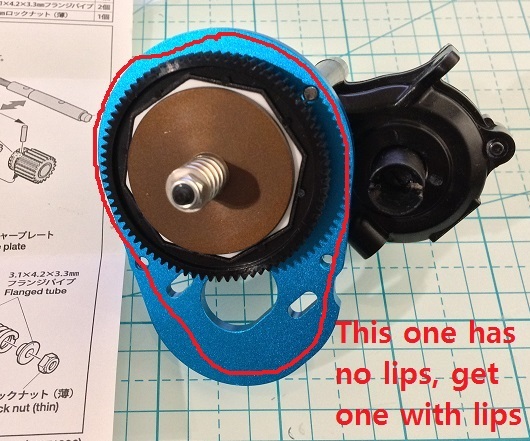 The aluminum gear plate with lips gives you a better seal. The optional "traction chassis" is just a bit more heavier, instead of that, I'd opt for more weight on the nose. The slipper clutch is tricky to install later because it uses the same parts from the original set up that you have to take off. Incorporating it when building is convenient (if you are going to use a stronger motor).